Return of the pint pot! Yes, today I located a brand new pint pot for £2.75 on Skipton market. Every working chap used to have one of these and they were very easy to obtain. Sadly no longer (‘cept in Skipton market). All those working chaps seem to drink pop, what is the world coming to? But perhaps we have met the turning point at last. Long live the pint pot! My wife is taking bets on how long it will last – I have a bad habit of breaking them, usually by dropping them out of the jock bag as I take it out of the Land Rover. I’m taking care of this baby, it is china apparently – rather posh for a man o’ the woods (even if it is a second), but what the heck, you have to take those opportunities when they arise – I can’t be doing with a tin mug with a picture of flocks on the outside for aye. 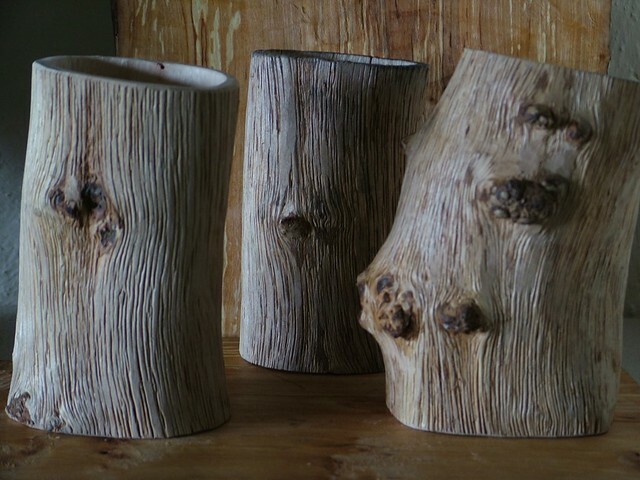 Return of the killer oak shrink pots. Three more, all from the same branch, they are now awaiting blackening with vinegar and iron. Like the back drop? It’s from m’new pattern book bindings. Shows at the National Forest and Kilnsey coming up over the Bank Holiday, busy, busy. Elm to dig out from store for a stool, gates to hang, bench to fit with new boards, phew, makes me feel tired even on my day off. This entry was posted in Appropriate technology, food, Green woodwork, wood and tagged pint pot, shrink pot by Flying Shavings. Bookmark the permalink. Whats all this about ‘days off’ then! You feel tired, imagine how exhausted we are just reading about it! What a great list of different jobs to do, you could be worse off, it could be 10 of the same. 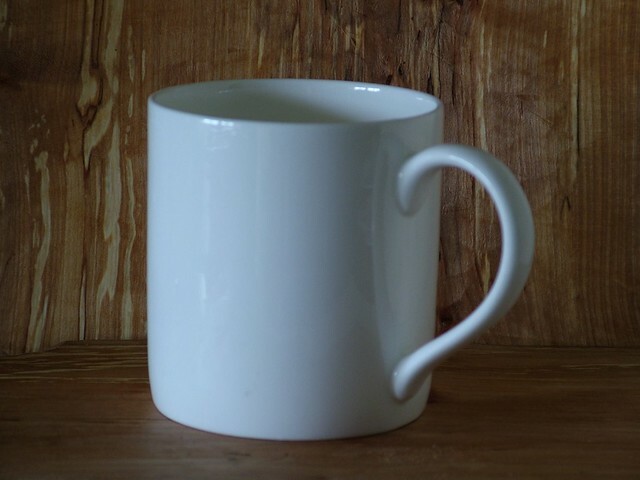 Nice mug by the way. Down here in the soft underbelly of the south, we don’t have jock bags. I’m not sure I want to know what it is, or how your mug manages to fall out of it!